The good news is that we have always had chimney swifts nesting in one of the chimney flues in our house. The bad news is that we have always had only 4 to 8 adults each year, with no sign of an expanding colony. One pair usually nests in the west chimney, in the flue used by the wood stove in the kitchen. At times, it appeared that a second pair might be nesting in the other chimney, but the other adults may just be unmated helpers. All 6 chimney flues have bends in them, making it impossible to see from one end to the other. When we have a cold snap in May, we cannot light a fire, for fear of asphyxiating the swifts or causing them to desert their nesting site. 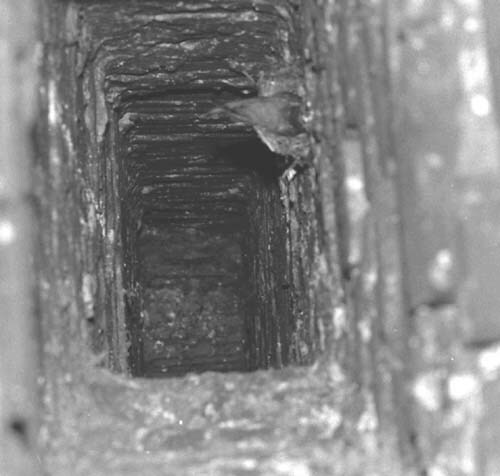 When the barn owls left the east chimney to use the attic nestbox, a pair of chimney swifts moved into the flue traditionally used by the male owl. Rearing young in a carcinogen coated chimney has never appealed to me. Someday I will make a chimney swift tower. Aug 3, 2004 We now have eight chimney swifts performing their aerial display over the house each evening. Four must be the fledglings. Their coordinated flights are unlike anything our swallows or martins do. Is it just for the sheer pleasure of high speed synchronized flight? Jan 7, 2015 After years of finding fallen swift nests at the bottom of the chimney and often dead nestlings, we have finally built a swift shaft in the silo. The crumbling brick surface in our very old chimneys are not safe nest sites. There are many other mid-19th C brick farm houses in the area that could be used by chimney swifts, but many likely either are in equally poor condition or have metal liners or caps. Much is written about the problem of modern chimneys excluding swifts, but an even greater problem for them may be inviting them to a chimney where their nest and eggs or young may be washed down in the first heavy rain. &COPY; 1999 - 2015, American Artifacts and Richard Van Vleck, Taneytown, Maryland.